About twelve years ago, my family went on vacation to the Black Hills of South Dakota. It was a wonderful trip and included stops in the Badlands, Mount Rushmore, and Crazy Horse. We stayed in a cabin, deep in the Black Hills, and soaked in the stunning beauty of the area. The Black Hills Spruce is a native tree, known for its short needles and deep-green color. On our last morning there, my children and I borrowed a kitchen knife and went in search of seedlings wanting to migrate to Kansas. We found 5 yearlings, each only a few inches tall, growing in the rocks beside the road – a certain death sentence as they grew. We carefully dug them up, wrapped them in wet paper towels, and placed them in a plastic bag to retain moisture for their journey south. Once home, I replanted them in pots and nurtured them in a protected area near our sunroom. Today, the four survivors are about 3’ tall and are happy, thriving participants in the Hildenbrand ecosystem. What is interesting about our adopted trees is that they no longer look like Black Hills Spruce, even though that is what they are, genetically. Instead of the short, dark-green needles characteristic of their species, they have longer, bluish needles, much like a Blue Spruce. Clearly, they are still spruce trees, but they no longer resemble their siblings in the Black Hills. Their new environment has changed them into a different version of their old selves. In the words of Paul in his letter to the Corinthians, they have become a new creation! There is a lot of research regarding whether how we are born – our genetics – or how we are raised – our environment – is most influential towards what we become. Obviously, some things will not change regardless of the environment. My spruce trees will never become oaks, raccoons, or granite statues. Within their genetic make-up, however, they have some flexibility. Becoming a Christian will not convert us, by itself, into a concert pianist or a professional athlete. Following the example of Christ, however, will help us become a more complete version of our self. Just as the new environment changed my spruce trees into something they would not otherwise have become, a good Christian setting will help us grow in ways not likely otherwise. We may look similar, but our lives will turn in a different direction. My spruce trees were changed from the inside out. Living with God as the center of our lives does the same. We no longer live just for ourselves, or as if this life is all there is. We do not “hang on” for the end of the workday, nor do we simply hope to cruise into the weekend. As new creations, our lives have a renewed purpose and a deeper meaning, and we have a divine legacy to follow. Are Christians perfect? Certainly not, but we have a perfect leader to mold and shape us into useful vessels to carry the kingdom of God. Come home to church this Sunday. Let the old pass away and become new! 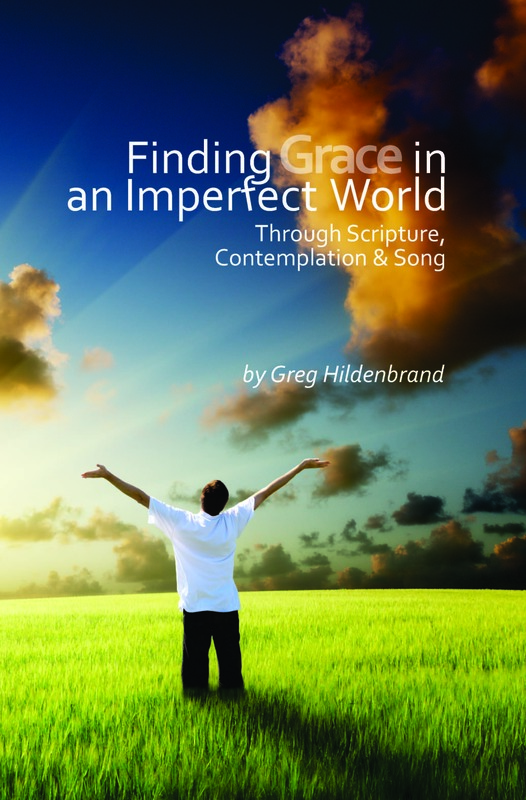 Finding Grace in an Imperfect World is a soulful collection of Scripture-based meditations and songs – a powerful tool for building or strengthening a relationship with God. 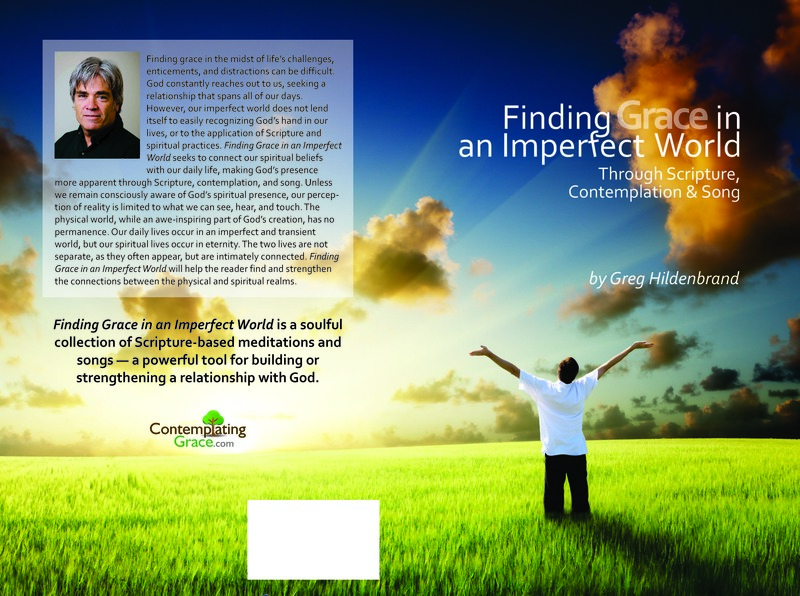 Now available at the downtown FUMC-Lawrence office, at http://www.ContemplatingGrace.Com, at Amazon.com, and other media outlets. In his book, A Hidden Wholeness, Parker Palmer writes, “The deeper our faith, the more doubt we must endure; the deeper our hope, the more prone we are to despair; the deeper our love, the more pain its loss will bring.” He follows this comment by saying, “If we refuse to hold them in hopes of living without doubt, despair and pain, we also find ourselves living without faith, hope, and love.” Palmer makes it sound as if we are damned if we do, and damned if we don’t. I believe I have seen the truth of Palmer’s words in my life. The person with the strongest faith that I have known was my Grandma Hildenbrand. Her mother died young, leaving my grandmother to raise her 4 younger siblings. Two of her own children died as young adults. She lived through two world wars and the Great Depression, and worked sun up to sundown as a farm girl, and then a farm wife. Grandma had a harder life than anyone I know, and she also had the strongest faith. I never knew her to waiver in her faith, including as her health steadily deteriorated in her final months on earth. She remained optimistic, cheerful, and feeling blessed to the end. When I was a child, there were times when Grandma’s faith seemed to get in the way. We could watch whatever was on television – any of the 3 channels – unless Billy Graham was preaching, in which case we would be watching Billy Graham. Church attendance on Sunday mornings was mandatory, as were prayers of thanksgiving before every meal. Grandma believed God’s plan was perfect and that all things would work together for good – no matter how bad things got. In his Sermon on the Mount, recorded in the 5th chapter of Matthew, Jesus proclaims a number of enigmas. Endurance through pain and perseverance through difficulty will be rewarded, if not in this life then in the next. In the context of our live-for-the-moment world, maxims of the faith often seem foolish. Wise sages such as Jesus, Parker Palmer, and Grandma Hildenbrand talk about this life as if there is much that we cannot see or understand, as well as more beyond what we recognize as this life. Their faith is not rooted in what can be seen — indeed, that does not require faith at all. Palmer’s point is that just because we risk experiencing pain when we love deeply is no reason not to love deeply – or to believe strongly, or to hope defiantly. Like Grandma Hildenbrand, when life knocks us down we are to get back up, dust ourselves off, and keep moving forward with confident certainty that it is better to have loved and lost than never to have loved at all. Come home to church this Sunday. Rejoice and be glad, for your reward is great!